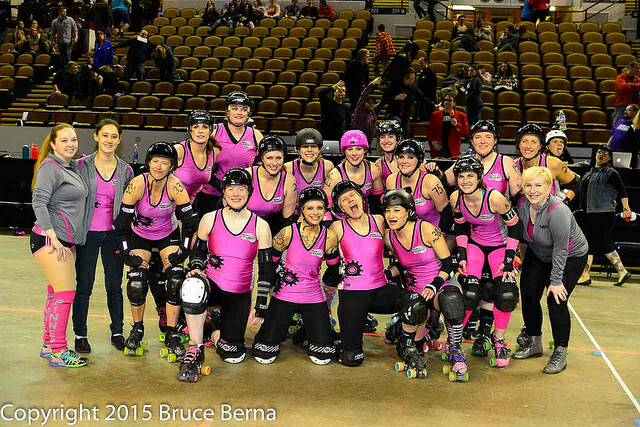 Nothing warms up a cold and dreary winter like hot roller derby action (well, that and a nice little March heat wave), and there was plenty to look forward to as the Brewcity Bruisers closed out their 2015 regular season with two action-packed bouts. Our first bout of the night featured the Crazy Eights going for their 12th win in a row against the last team to defeat them, the Rushin’ Rollettes. The nightcap showcased two teams that have had a bit of history against each other over the last couple of seasons as the Shevil Knevils (where was their mascot, Robby?) took on Maiden Milwaukee. If the Rollettes were to succeed, tonight their top priority had to be to stop the Eights from getting off to their usual fast start. 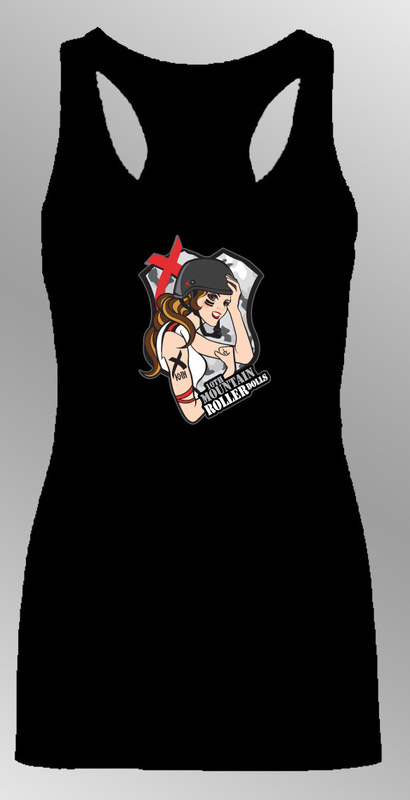 The first jam went well as Rollettes jammer Stryker was able to get lead jam and give the Rollettes a quick 3-0 lead. Unfortunately for the Rollettes, this would be their last points lead of the night. The Eights came right back and took lead jammer in the next four jams and opened up a 27-3 lead before the crowd could even get settled into their seats. 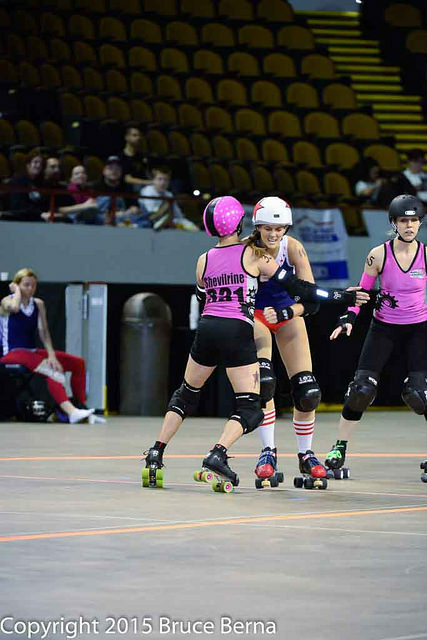 The Rollettes’ Rookie jammer Jackpot was able to pull a few points back in Jam 6 to cut it to 27-9. But in typical Eights fashion, they came right back and took lead jammer in 7 of the next 8 jams and now had a 42-16 lead with 12:30 remaining in the first half. The Rollettes were doing a good job of keeping the Eights’ scoring to a minimum, but they needed to find a way to score themselves. 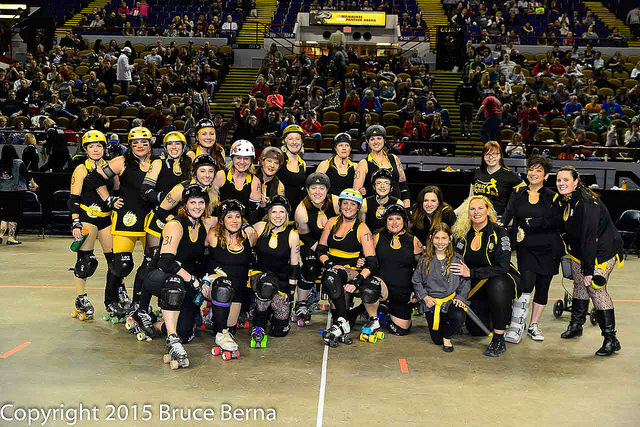 Finally in Jam 15 the Rollettes took advantage of a jammer penalty and pulled things back to 42-24. And yet again, the Eights took lead jam status the next four jams and now had a 75-24 lead with 6 minutes remaining. The Rollettes had no quit in them tonight, though. Frau Kapow, Stryker, Mellon Collie, and Steamy Wonder all won lead jam status over the last four jams and were able to keep it close, bringing the Eights lead down to 75-45 at halftime. The 75 first-half points scored by the Eights was their lowest of the season. Unfortunately for the Rollettes, their 45 points was the fewest points scored by any team in a half all season. But being down 30 is not an insurmountable lead. In Bout #1 of the season the Rollettes found themselves down by 35 at halftime and came all the way back to take the lead against the Shevils before ultimately losing a close bout in the final jams. Could tonight be the night they made the comeback and finished with the win? Things started on the right skate as Frau Kapow earned a 5-0 jam to start the half, reducing the Eights’ lead to 75-50. Just when things looked like they might go the Rollettes way, Cookie Ciano, D’Amanda Beating, and Schoolhouse Rock all took lead jam status and opened the lead back up to 102-52. And that really was the story of the 2nd half. The Rollettes would have a couple of good jams and get the lead down to 25-30, and the Eights would come right back and open it back up to 50. The Rollettes just needed a bit more, but when going against a team that is able to jam so many of their eligible skaters (Eights used 7 jammers in this bout) it is hard to sustain continued success through an endless supply of fresh jammers. In the end it was #12 in a row for the Eights with a 163-113 win. These teams will meet up again in the Semi-Finals and I fully expect a repeat of this competitive bout. 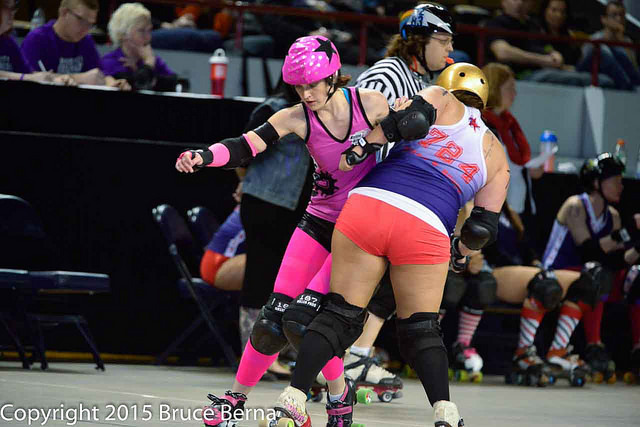 MVP Jammer: Schoolhouse Rock – This was definitely a little of a coming out party for Schoolhouse, and while she may not have been the most used jammer during the bout, it is not possible to ignore the performance she had. Getting only 5 jams with the incredibly deep rotation it can be hard to be noticed. 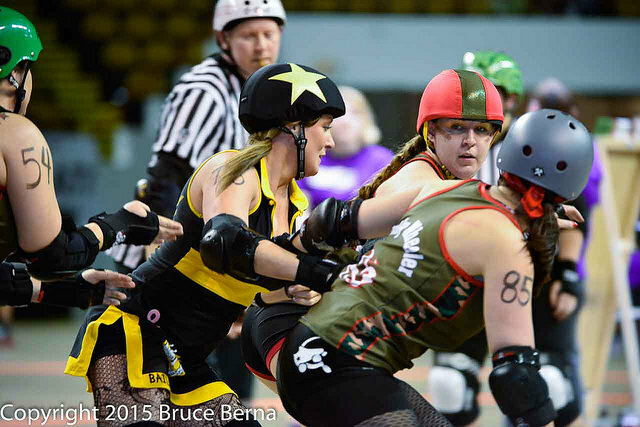 But when a jammer gets lead jammer in all 5 of their jams and outscores their opponents 39-5, that jammer wins MVP. I feel we are just beginning to see how good Schoolhouse can be and this bout just proves that the Eights have another top-level jammer they can rely on. MVP Blocker: The Other White Meat – With the Eights again playing such a dominating, team style defense the MVP Blocker Award really comes down to those moments that just burn in your memory. 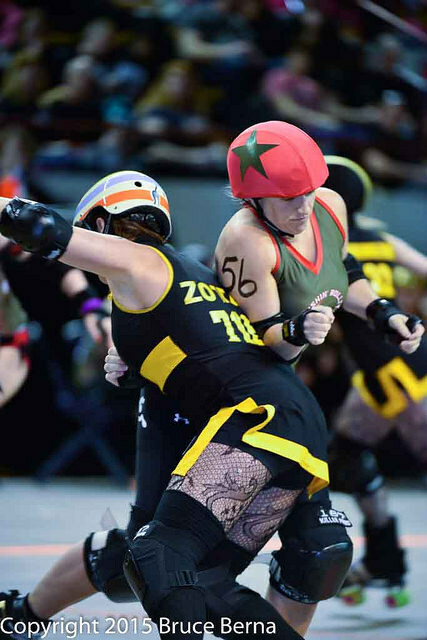 In the second half, with the bout still very much in the balance, Meaties had numerous jams where where she forced the Rollettes’ jammers to really struggle and then she knocked them down just as they were about to clear the pack. The final jam of the bout summed it up best as there were two huge collisions between Meaties and Rollettes jammer Frau Kapow. The result of both saw Frau go flying thru the air after meeting the immovable Meaties. The second bout featured two teams who not only met last year in a great semi-final bout, but will also meet again next month in another semi-final bout. With the seedings essentially set for next month (the #2 seed really doesn’t hold an advantage over the #3) this bout was really all about pride and getting momentum in your favor heading into that bout. The question now remained, who was going to go grab that momentum? It didn’t take long to see that tonight would totally be a night for the Maidens. The first jam was a thrilling 9-8 jam between Super Hera and Scooter. And the second jam was an equally exciting 7-4 jam between BCB Rookies LuBird and Jessie Flames. Then it was all Maidens. Over the next 6 jams the Maidens used a 14-7 jam by Super Hera, a 14-0 jam by Stormin’ DaCastle, and a 16-0 jam by Frank Hurt’r to open up a 76-23 lead just 15 minutes into the bout. As much as I credit the jammers in these situations, the blocking for the Maidens during this stretch was some of the best any team has had all season. With a lead like this some teams have a tendency to take their foot off the gas, but the Maidens were not having any of that tonight. They won lead jammer in 3 of the next 5 jams and forced a jammer penalty on Thrash Mama after she won lead status in another. And just like that, the Maidens had a 107-29 lead with still 9 minutes remaining in the first half. The Shevils were able to settle down at this point and the teams traded jams back and forth the rest of the half. But the damage was really done and the Maidens ended the half with a comfortable 128-43 lead. To highlight just how good of a half of derby that was for the Maidens, the 128 points scored was the most by any team this season and the 43 allowed was the fewest allowed by any team this season. The bout at this point was all but over, no lead in derby is safe but an 85 point lead is pretty safe. And for the Shevils, it was now gut check time and the real goal was to win the half. The second half saw the Shevils come out and play much better than in the first half, but they could never get closer than 66 points. The Maidens’ locked down defense never allowed the Shevils to get more than 10 points in an individual jam, and that was despite having to overcome 4 jammer penalties where a 15-20 point jam is not out of the question. But there were definitely some bright spots from the Shevils and plenty to be proud of. Scooter was able to outscore her jammer counterpart 32-4 in the second half and really took the Shevils on her back to keep the 2nd half a batter. Despite all those efforts, the second half ended tied 62-62 and the final reflected a 190-105 Maidens win. WIth these two teams playing each other again next month, was this a preview of things to come or will the Shevils come out firing? There is only one way to find out and that is to be there. MVP Jammer: Scooter – Before I get into Scooter’s performance, I have to mention the overall great performance by the Maidens jammers. With her team losing by 85 I can already see some questions in your head. But without Scooter’s performance the margin of victory could have been much more. Out of the 18 times the Shevils were lead jammer, Scooter was that jammer 11 times. Her 11 lead jams were the most by any jammer in the bout. And finally, when Scooter was their jammer the Shevils outscored the Maidens 52-33 (this does not count the 5 points she scored after a star pass). When Scooter wasn’t, the Shevils were outscored 53-157. MVP Blocker: Shevilrine – What a contrasting style in blocking we had between our two MVP Blockers tonight. While Meaties uses size and force to her advantage, Shevilrine put on a clinic of how quickness and well positioned blocking can be just as effective. In the first half in particular, Shevilrine would routinely put herself in just the perfect position for an offensive block that would allow the Maidens to get multiple lead jammers. Then, in a show of how important it is to play both offense and defense as a blocker she would recycle up thru the pack and catch the Shevils jammer just before they could escape the pack. Her play was a huge reason the Maidens were able to open up the first half lead they did and seal the win. The Season 9 Regular Season is now behind us, which can mean only one thing. PLAYOFFS!!! 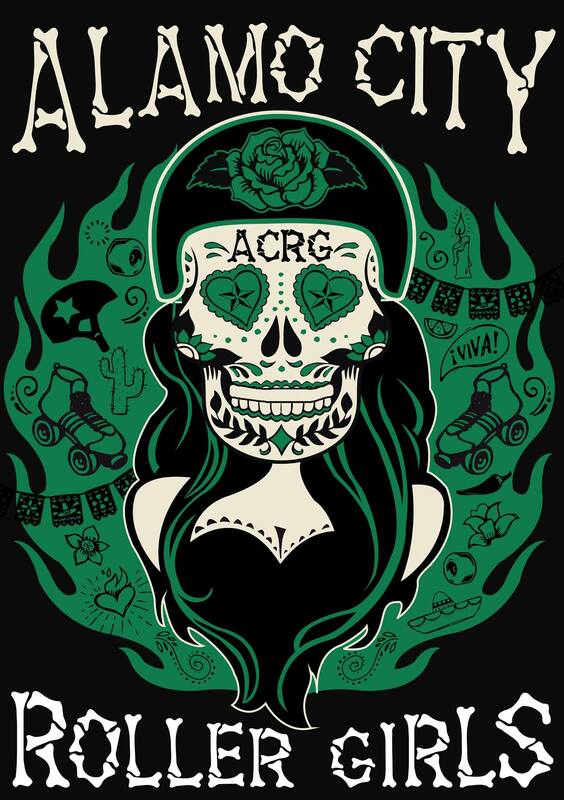 Be sure to come check the semi-finals on April 11th as the Crazy Eights will try to keep their 5-pete alive against the Rushin’ Rollettes and Maiden Milwaukee will continue their heated rivalry against the Shevil Knevils. Doors open at 6pm, with the action starting again at 7pm.